I’ve always had a love for maps. I’ve always owned and carried Atlases. I can spend hours looking at maps. I love Google Earth, I think it’s the best thing since sliced bread. The only way to improve it is to increase the resolution, and make it live! So that I can read over your shoulder. 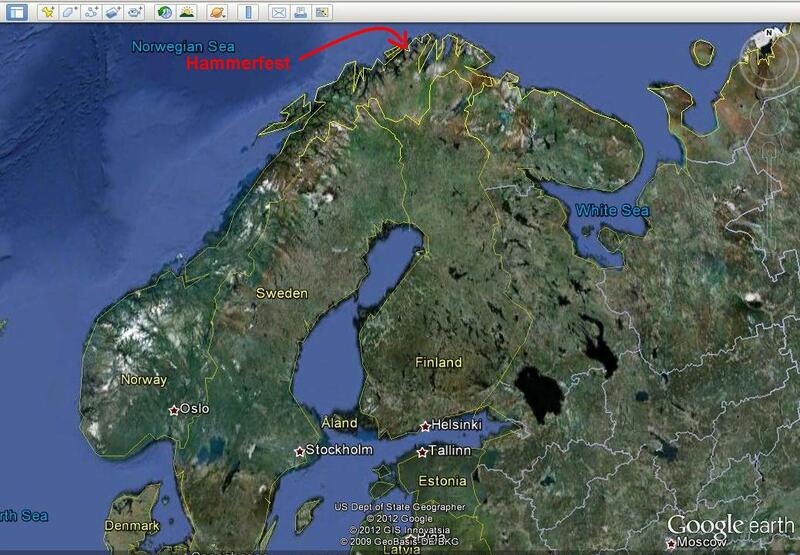 Neither is feasible but Wouldn’t it be cool?Years ago I found Hammerfest Norway in an atlas. My first thought was “What a cool name”! A hammering good party! My second thought was “What a cool location” way up there at the top of Norway. I wonder what kind of people live there. Later I found that Hammer in Norse means Anchor, and Fest in Norse means Rest. I still think the location is cool. Hammerfest is north of the Arctic Circle. 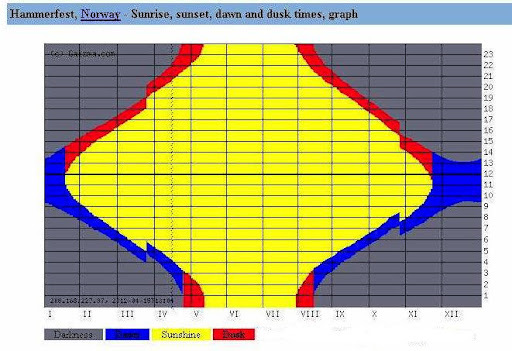 In the above chart, The hours of the day are listed on the right, the months are on the bottom. When it’s all yellow, it’s light in Hammerfest 24 hours a day. 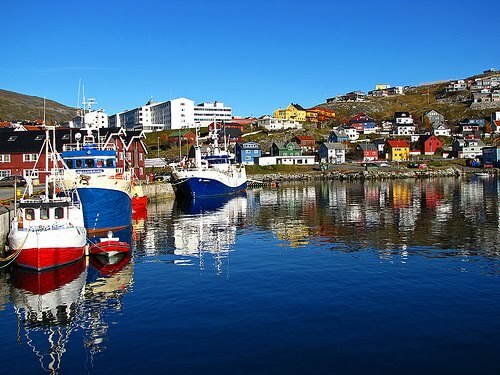 The picture below is called Reflections of Hammerfest by Rainer Schuetz. I’d like to visit someday, probably in the summer. But I don’t think it’s really vacation destination. It would be better to go for work for a month or two. Or maybe a year, I think it would be interesting to experience the days of light and the days of darkness at least once in ones life. Well, this is my post about Hammerfest, My only connection with Hammerfest is that I found it on the map a long time ago and never forgot it. I keep going back to look at it on the map. I read about it. I hope someday I get a comment: “Hey! 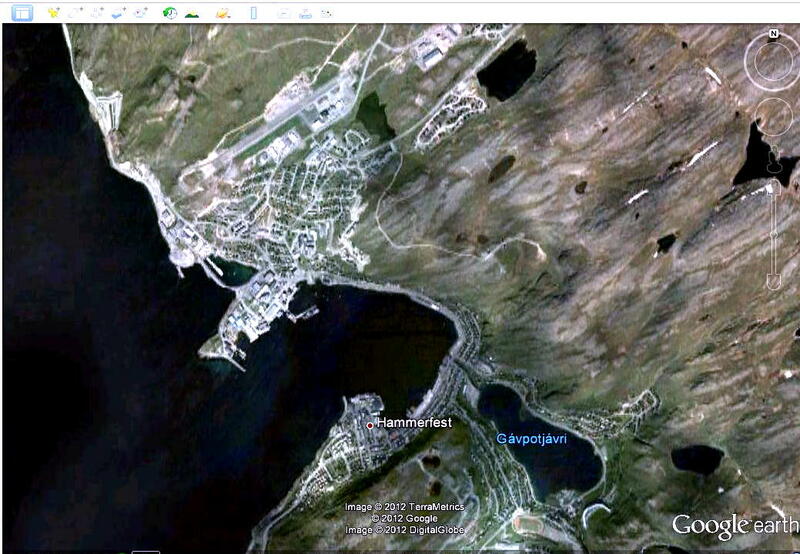 I’m in Hammerfest, and I’m reading your blog”. I've always wanted to go to Norway..I think the Roycroft side of my family originated from there..